A Web user doesn’t have that too much patience to wait for websites that take too much time to load. As a web site owner, put yourself in the customers’ shoes and think about it.Without good speed, there is no value of your web site. So, optimize the formats and responsive sizes of the media that you have uploaded onto your website and sort out lost links and valueless data that slows down loading time. Remember one thing that it’s a race and the most important matter that Google has confirmed that website loading speed is one of the major ranking factors that Google user. It is truth that a principal section of the online customers is surfing the internet through their smart phones. Google has already programmed an algorithm 21 on April 2015. Which shows sites, that are responsive habit, will be prioritized, and rank higher in mobile search results. They have given clear idea about how to make a website mobile friendly. Use the mobile friendly test tools by Google to see if pages on your web site are mobile-friendly or not. Long tail keywords are keywords or key phrases that are good specific to your product or service than more common head keywords. Gradually, long tail keywords find less search traffic, but will usually have a higher conversion rate. If you have just started your SEO campaign for a brand-new website, then you should be more attentive on long-tail keywords. Because a new website doesn’t have much of authority to compete with big branded websites. Improving the right kind of content is not like composing a music track: it’s not very likely that you will become a one-hit-wonder with just one post. Quality trumps quantity when it comes to online content. A search quality senior strategist at Google recently has revealed that “Backlink” is one of the top 3 ranking signals in Google’s search algorithm. Look what Google is saying about the role of backlinks. Speaking to computers was unimaginable until movies like Star Trek popular such ideas of future technology. Being able to speak to machines and having them work for us gradually came to the trend for the R&D of various companies. Today, it has been known view in case of online queries. Now, you might be wondering how to optimize your content voice search. It is high time to improve your website content by incorporating long tail keyword. Conversational phrases should be added while optimizing conversational voice search. Apply a keyword strategy that goes well with how people talk and ask questions in real-life situations. Think about questions that can be thrown at you by the customers and create content that focuses on those conversational search terms. If one were to describe the internet, adjectives like ‘private’ and ‘confidential’ would hardly crop up. To this date, there are many internet activities missed out on because people are cautious of their personal information and don’t trust the internet as a secure and private medium. In the world, social media is bigger. The first websites newbie’s are expounded to Face-book and other social media accounts. Almost everyone online has at least one or two social media accounts. Everybody wants their page in first page of internet. Now, it would be really unwise not to strive to be a part of that. A single post showing up on someone’s timeline can interest the user to click it. Moreover, they share, comment, re-post, and contribute till they ensure that the people they care about have read those articles. Through the use of social media, your marketing content can be shared more and more. This would make the content reach more people within short span of time. The more eyeballs you can attract, more chances are there that your services would get exposed to the wider audience, resulting in increased follower base. The domain of internet doesn’t revolve around a particular search engine only. Understand that search engines aren’t a monopoly. No engine has reached that summary of performance yet, so that it can command every search query. There are still users who prefer Yahoo or Bing, and some are just plain used to it. Some unknowingly set the others as default browsers and never notice a change. Understand that this requires you to adapt to the workings of the major search engines and develop your site accordingly. Rules of sales: Customer is always right. Rules of internet: User is always right. Of course, don’t take this too literally, but understand the message behind this. Right from the first click, your site must service the user like a shopkeeper must service a customer. Guide them through the various options that your site offers at a good speed. Strategical assistance will do wonders in this field. Keeping the experience pleasant and user-friendly will guarantee a return and better ratings.Don’t just communicate, SERVE.The advanced Search Engine Optimization techniques and strategies in 2018 are expected to improve the functionality and quality of a large number of websites.With more people becoming educated on the subject, we can expect much better experience from engines as well as leading sites like Wikipedia, etc., to boost their game and improve one of the best things in the world: The World Wide Web. 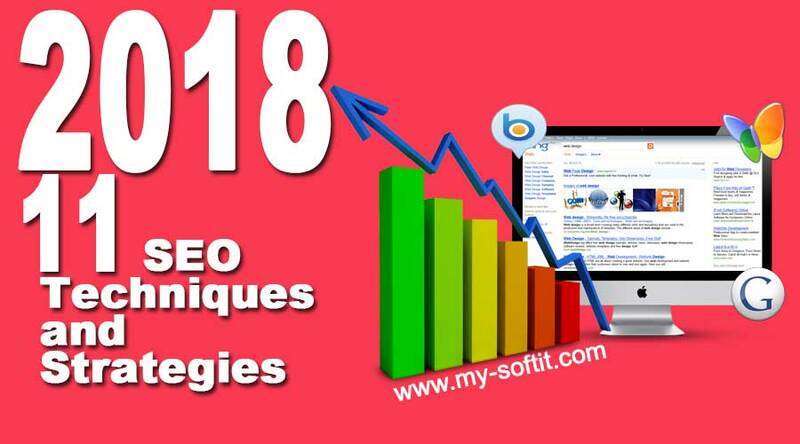 Really awesome article 11 Advanced SEO Techniques and Strategies for 2018.